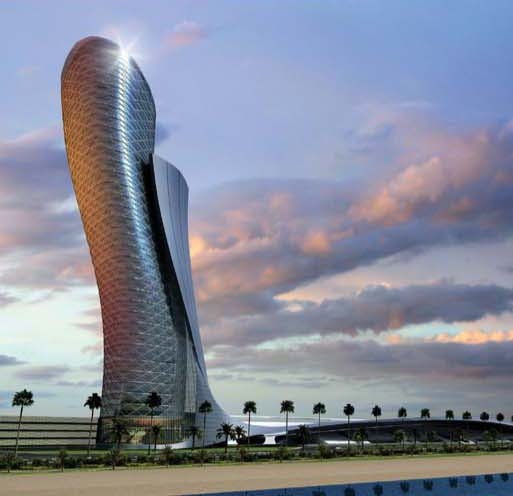 As construction of Capital Gate continues in the UAE capital city, Abu Dhabi National Exhibitions Company (ADNEC), which is developing the iconic building, and RMJM, project architects, have submitted a joint application to the Guinness Book of Records to recognise the Capital Gate tower as the “most inclined in the world”. Capital Gate leans westward an astonishing 18 degrees; by comparison the Leaning Tower of Pisa leans less than 4 degrees. Because of its unique posture, the tower is being constructed on top of an incredibly dense mesh of reinforced steel. The dense mesh sits above an intensive distribution of 490 piles which have been drilled 30 metres underground to accommodate the gravitational, wind and seismic pressures caused by the lean of the building. Besides being believed to be the ‘world’s most inclined’ building, Capital Gate Tower Abu Dhabi also features 728 unique custom-made diamond-shaped glazing panels. Due to the structure’s curving shape, each pane of glass is different and each will be fitted at a slightly different angle. RMJM is a UK-based international firm of architects with offices throughout the UK, Asia, the Middle East and the USA. Founded in 1956 by renowned British architects Robert Matthew and Stirrat Johnson-Marshall, today RMJM is one of the world’s largest architectural practices and employs approximately 1,300 people in 14 international offices in Cambridge, Dubai, Edinburgh, Glasgow, Hong Kong, London, Moscow, New York, Philadelphia, Princeton, Shanghai, Singapore, St Petersburg, Warsaw and Washington D.C. RMJM’s expertise and design-led approach is successfully demonstrated in on-going projects in more than 20 countries spanning a wide range of key sectors, from corporate headquarters and waterfront residential developments to major public buildings, university campuses and large-scale regeneration programmes. RMJM currently has over £10 billion (US$20 billion) worth of construction projects on its drawing boards, including some of the world’s most high profile and ambitious projects. Abu Dhabi National Exhibitions Company (ADNEC) is a strategic international venue development and management company. ADNEC’s venue portfolio includes one of the most modern exhibition centres in the world – the Abu Dhabi National Exhibition Centre, and the UK capital’s largest exhibition and conference venue, ExCeL London. ADNEC is creating unique business districts to serve Abu Dhabi’s rapid expansion and emergence on the global stage. Development projects surrounding the Abu Dhabi National Exhibition Centre include Capital Centre (a mixed-use development of 23 residential, commercial and mixed-use towers adjacent to the exhibition centre), Capital Gate (an iconic 35 storey gravity defying feature tower, featuring the 5-star hotel – ‘Hyatt at Capital Centre’) and a 2.4km Marina zone. In addition, ADNEC is expanding within the region, with The Al Ain Convention Centre, a residential and business micro city around a state-of-the-art convention centre. Abu Dhabi National Exhibition Centre (ADNEC), designed by award-winning architects RMJM, has won Construction Week’s 2008 “Project of the Year” Award. The Gulf’s largest exhibition venue illustrates ADNEC’s commitment to providing the city with world-class facilities for business and its bold plans for the future development of Abu Dhabi as a commercial destination. Now in its fourth year, the Construction Week Awards honour innovation and excellence in the Middle East. The awards recognise outstanding performance in 16 key areas of the construction industry selected by a high profile panel of construction industry experts. The Project of the Year Award was accepted by ADNEC architects, RMJM. Collecting the award was Associate Director and Senior Project Architect, Tony Archibold and Director Brian Mee, at one of the construction industry’s most prestigious events on 5th November. Commenting on Abu Dhabi National Exhibition Centre, one of the judges said, “The form and design combined with high functionality makes the whole building a very special one. It will definitely be a milestone for exhibition centres in the future.” The Construction Week Awards judging panel recognise projects that demonstrate uniqueness in approach and achievement through the use of technological advancement. “Not only has the exhibition centre solidified Abu Dhabi as a provider of world-class exhibition and conference facilities but architecturally, the curved and fluid design reflects the visionary nature of the development,” said Gordon Affleck, Design Principal for RMJM Middle East. Ovoid forms and futuristic styling define the Abu Dhabi National Exhibition Centre’s exhibition halls and concourse. When complete, the 48 hectare development will include the Capital Gate tower, Abu Dhabi’s iconic feature tower that is currently being considered by the Guinness World Records as “the world’s most inclined building.” Capital Gate is also designed by RMJM. Abu Dhabi National Exhibition Centre has been the built as the centrepiece of the AED8 billion (US$2.2 billion) Capital Gate project, a fully integrated community development that is considered a strategic element of the Abu Dhabi 2030 vision.